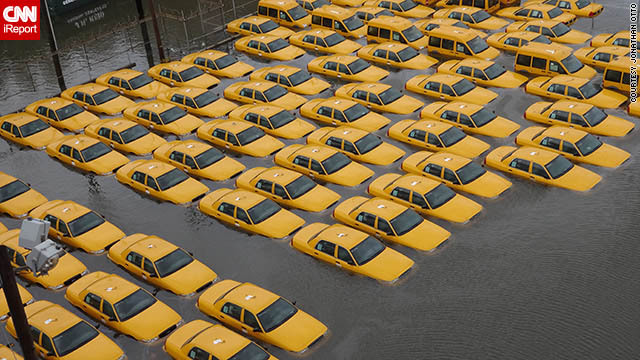 Taxis are hard to get in NYC right now. Uber, a company that makes an app you can use to summon a private cab, had to deal with an extremely messy situation in New York yesterday. Now it’s having to deal with obnoxious punditry. Let’s hit yesterday first. Because the subways were (and basically still are) out, Uber’s black car drivers were in huge demand. To get the drivers to pick up Uber customers, Uber had to start paying them 2X their normal rate. At first, Uber passed this rate increase onto its customers through a program it calls “surge pricing.” But then customers and reporters started complaining, saying that Uber was “price gouging” in the middle of a disaster. So, while continuing to pay drivers 2X their normal rate, Uber started charging customers 1X the normal rate. This act of generosity (and, let’s be honest, PR damage control) cost Uber about $100,000. Kudos for the honesty despite certain backlash from critics a thousand miles away. First and foremost, we hope that you and your family and friends are safe. The Uber NYC office is currently closed and some of our team members are without water and power. With limited public transportation, demand for Uber rides is astronomically high. That means we’re working to get as many drivers out as possible to help New Yorkers get around the city. So, in order to maximize the number of drivers on the system yesterday, we started paying drivers 2x the fare on all trips – and in the meantime charging riders the standard 1x fare avoiding surge pricing for most of the day after Sandy. Doubling drivers’ fares tripled the number of cars on the road and kept them out there far longer. However, footing the bill for higher driver costs came at a significant expense to Uber with over $100,000 in additional payments to drivers in a single day – something we can’t continue indefinitely without breaking the bank. So while we were mostly able to avoid higher prices the day after Sandy, the reality is that under this week’s extreme conditions, raising the price is the only sustainable way to maximize the number of rides and minimize the number of people stranded – by providing a meaningful incentive for drivers to come out in undesirable conditions. Later this morning we will be reverting back to standard Surge Pricing for riders. It is a hard decision, but one we feel strongly about. Without raising the price, there will be less than ½ the number of drivers on the system with several times more demand on far fewer drivers. Without Surge Pricing, Uber would become essentially unusable this week. For those needing a ride this week, it’s going to be expensive; there will be a clear pricing notification in the app at the time of request. During this emergency price increase, Uber will waive all of its own fees with 100% of the fare going directly to the drivers helping New Yorkers move around the city. Our thoughts and prayers are with all New Yorkers in this time of crisis. We’re going to do everything we can to continue to provide the most reliable, efficient transportation option for NYC. Be safe, and stay Uber. Super interesting article. Thanks so much for sharing. I feel for Uber.